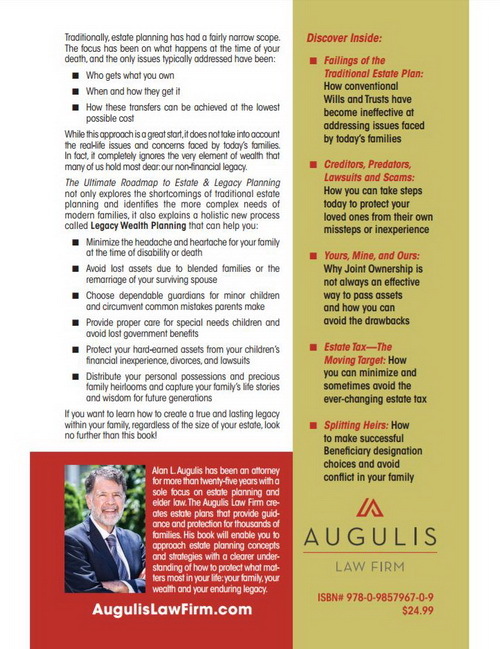 Have you always thought that estate planning was just about what happens to your property when you die? If so, then you’re certainly not alone. Millions of Americans have grown up believing much the same thing, and there was a time when they would have been 100% correct. In times past – and for many people even today, estate planning involved nothing more than these three things: who gets your belongings when you pass away, how they get those assets, and how you can accomplish that transfer of ownership with a minimum of cost. Historically, those concerns were about all that mattered. 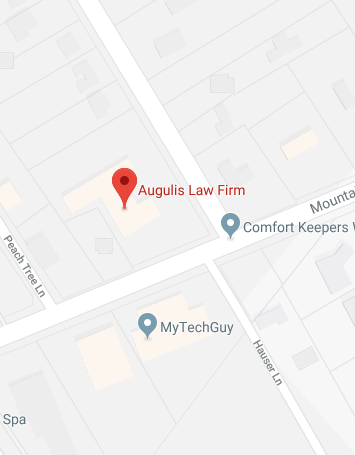 The whole idea of estate planning was born out of the need for a legally-enforceable way to properly pass on property to heirs. And since land and money were the only real currencies that mattered for most of human history, that form of estate planning worked. Today, though, you care about more than just a parcel of land or money in an account. While your estate planning needs certainly encompass such basic concerns, there are a whole host of other issues that come into play as well. These days, you have interests that have little to do with actual financial wealth or forms of property. Beyond issues involving land titles, taxation, and legal questions about inheritance rights, you have a wealth of non-financial concerns that must be addressed. Modern societies necessarily require that you think about issues related to minor children, special needs, and similar concerns that cannot always be easily dispensed with through traditional estate planning means. In The Ultimate Road Map to Estate and Legacy Planning, we’ll introduce you to the new, modern estate planning techniques that have arisen in response to the evolving state of our modern society. 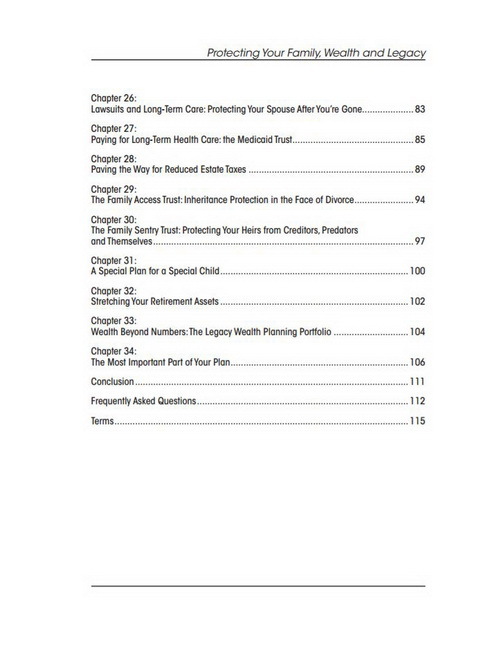 You’ll discover how wealth and asset transfers have become just one of many important factors that estate planners must take into consideration as they strive to prepare for the future. You’ll learn that there’s much more to modern estate planning than figuring out who gets that favorite Aunt’s tea set. 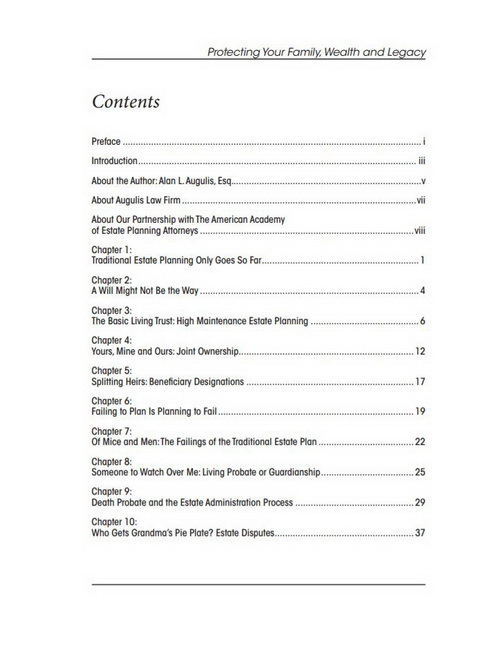 Obviously, traditional estate planning leaves much to be desired when it comes to comprehensive strategic plans that can accomplish all of these modern objectives. 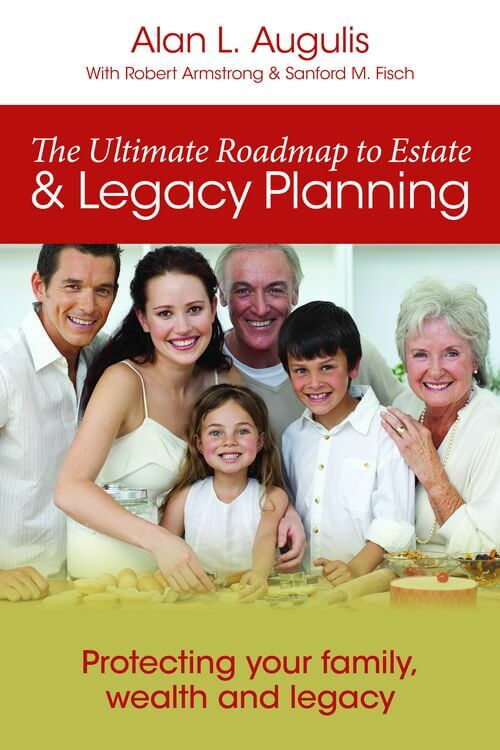 As The Ultimate Road Map to Estate and Legacy Planning reveals, however, a new holistic estate planning approach – Legacy Wealth Planning – can ensure that your estate plan is designed to meet this new planning paradigm. 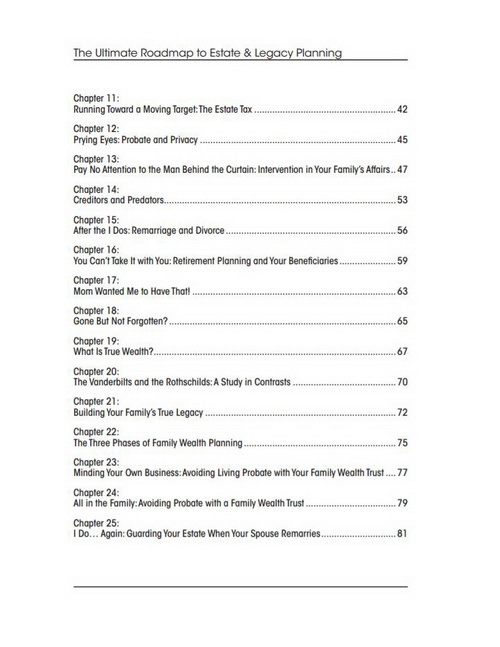 With this book, you can ensure that your family has access to the information you need to minimize estate planning mistakes that have plagued other families for decades. Today’s challenges include divorce rates that are higher than at any time in history, out-of-control frivolous litigation, long-term care costs that have risen steadily for a generation, increasing medical costs, and the ever-present threat of bankruptcy. With all of those risks lurking around every corner, you simply cannot take chances with your family’s future. If you do, they could become just another in a long line of statistics. To avoid that fate, you need to learn how to take care of your financial and non-financial legacy planning in a way that can stand the test of time. 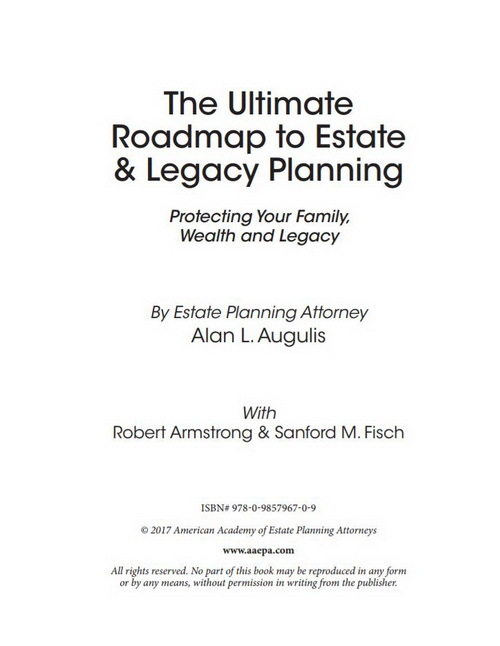 If you want to secure your family legacy and protect your loved ones’ rights and interests, then you need The Ultimate Road Map to Estate and Legacy Planning now so that you too can learn the secrets to effective estate planning that really works. 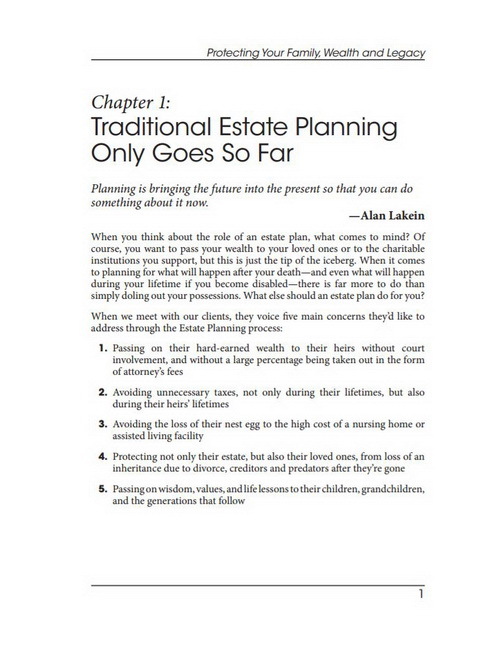 This book is the one tool you need to provide your loved ones with the estate planning techniques they need to accomplish your family goals.